Fong graciously passed on the e-mail address of 何英才 Ho Ying Choy, the son of Master 何金銘 Ho Kam Ming. Unfortunately, from September through December, I was so incredibly busy with work that I had not an ounce of spare time to think about writing to Mr. Ho. Finally, beginning January, I was able to send him a letter. Henry Ho (Ho Ying Choy) responded quickly and pleasantly, and I planned my trip to go see him. Henrey lives in the city of 珠海 Zhuhai, on the coast of south-eastern China. For reference, I have been living in Guangzhou, which is inland, and the capital and largest city in 广东省 Guangdong Provence. If you go south of Guangzhou, you will pass through the very modern city of 深圳 Shenzhen (which, I have heard, is full of young-urban-professionals, a few children and no elderly). Once through Shenzhen, further south, you will enter 香港 Hong Kong, through 九龙 Kowloon. Just east of Shenzhen, across a bay, is the city of Zhuhai. Just south of Zhuhai is 澳门 Macau. Hong Kong used to be a British colony, and Macau used to be a Portuguese colony. Both are now autonomous regions of the People’s Republic of China, and both are combined paninsulas and islands. Americans can easily get a VISA to enter both, whereas the mainland is more difficult to access. Zhuhai, Shenzhen, Macau, and Hong Kong are known collectively as the four corners; much like Colorado, Arizona, New Mexico and Utah, in the States. 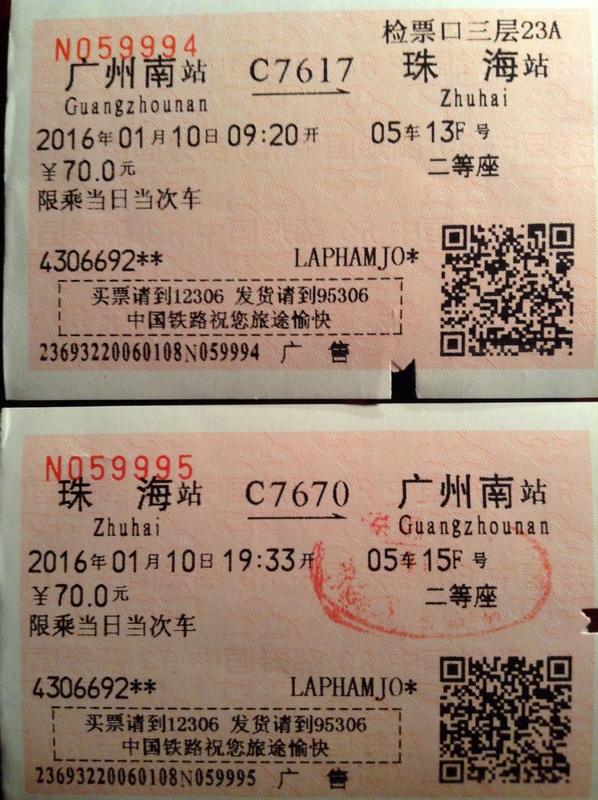 I booked a high-speed rail trip down to Zhuhai on Sunday, the 10th of January, to return that evening.